With Thanksgiving only a week away (where did November go? ), it’s all hands on deck for the big feast. We have all the gear, tips, and tricks you need for a smooth holiday. That means cast iron for your pies and rolls, a pellet grill for smoked turkey and extra oven space, and one of our favorite products, the Turkey Cannon. When our customers see the Turkey Cannon, their first question is invariably: “What is that thing?” To be fair, you probably haven’t seen many turkeys cooked this way. It’s Thanksgiving’s best kept secret. The concept is simple. If you’ve ever had Beer Can Chicken, our Turkey Cannon Infusion Roaster works in much the same way. 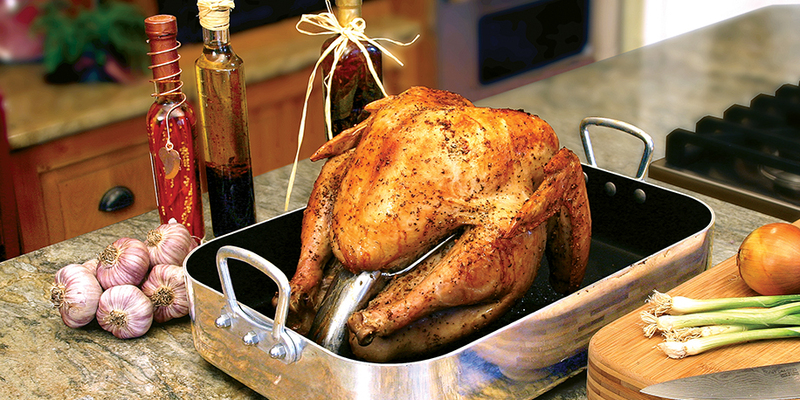 With a liquid of your choice in the center tube, the Cannon roasts turkey from the inside out. This keeps the moisture locked into the meat, and it cuts your cooking time nearly in half compared to the traditional oven method. At last, you could be eating on time on Thanksgiving afternoon. So if you’re ready to transform your Thanksgiving this year, read on to learn how to use the Turkey Cannon. 1. Set up the Turkey Cannon inside a roasting pan. The turkey drippings will accumulate here, and you can use them for delicious gravy later on. 2. Fill the tube with a liquid (and any seasonings) of your choice up to the first hole. Some of our favorites are apple cider, cranberry juice, chicken stock, and cooking wine. The flavor of the liquid doesn’t affect the turkey meat very much—you’ll want to choose your liquid based more on what type of turkey gravy you’ll want (if you’re using the drippings). 3. Lightly spray the Cannon with cooking oil before placing the turkey. 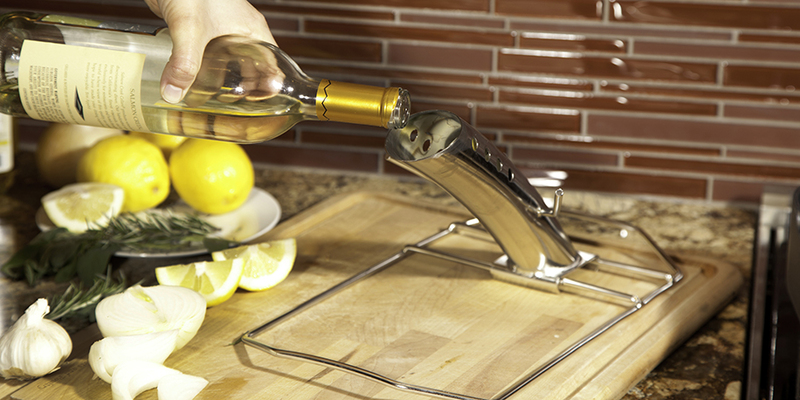 This will prevent bits of food and seasoning from sticking, making your clean-up easier. 4. Mount a cleaned and prepped turkey onto the center tube. If your bird is 10-18 lbs., place it breast-side up. If it’s any bigger than 18 lbs. (we recommend a maximum size of 20 lbs. ), place it breast-side down. 5. If you cook your turkey breast-side down, remove it from the turkey cannon and roast it breast-side up for the last 20 minutes or so of cooking. This will give you a nice, browned finish on the breast. 6. Rub the turkey with butter, oil, seasoning, etc. of your choice. Separate the skin slightly from the meat so you can spread some seasoning underneath. 7. Because of the incredible moisture of cooking with a Turkey Cannon, brining beforehand is optional. Whether you do so or not, your bird will be tender and juicy. 8. For best results with the Turkey Cannon, you should smoke your turkey in a SmokePro pellet grill. However, the Turkey Cannon also works wonders in your conventional oven. 9. Find our estimated cooking times here to know how long your turkey will take to cook. Remember to always measure by internal temperature rather than cooking time. The turkey breast should reach 165° F. 10. As soon as the turkey reaches the desired temperature, remove it from the heat and tent it (cover with foil) for about 20 minutes. You can also place it in a cooler for up to 2 hours. This will keep it warm and will allow the juices to absorb back into the meat. Are you ready to see how this strange kitchen contraption can take your Thanksgiving to the next level? Forget dry, bland turkey that takes all day to cook—get yourself a Turkey Cannon today.